When Jeff Kear and Steven Feingertz decided in 2007 to leave the marketing and ad agency they started in 2000, they felt burned out and wanted to create their own product to market and parlay into a new business. Kear, Feingertz, and subsequent co-owner Gavin Vincent, got their feet wet with a tool for the wedding industry, because the tools were easier to build and, at the time, the market was underserved. The initial test product came out in 2007. The three proceeded to build it up and refine it, while getting requests from people who wanted something broader to meet the requirements for other events. Today, Planning Pod software offers more than 30 features. Though most event-planning software has some features that other don’t, there is a lot of overlap. 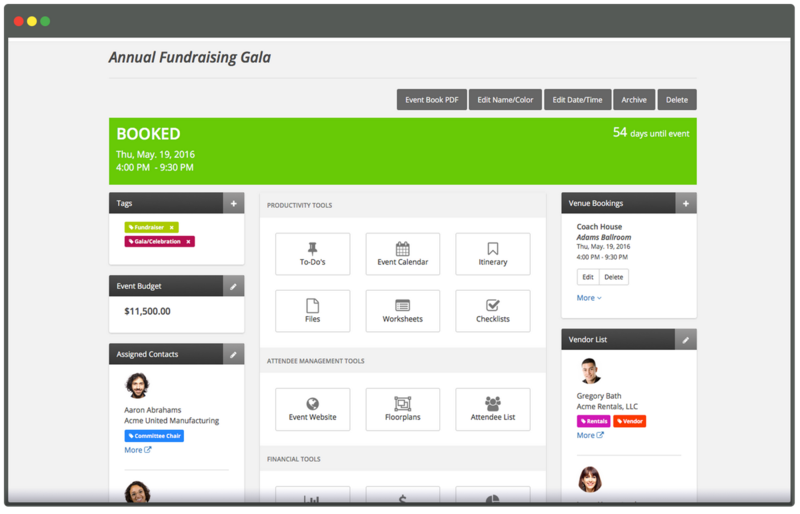 Kear says his software provides an all-in-one solution – everything from when event planning begins (or even prior to that, as entrepreneurs use it to manage leads, proposals and invoicing) to managing all event details. Tools include one for managing the budget, itineraries, and attendees, as well and collecting RSVPs, building websites, and collecting event registrations. “I wouldn’t say this is the only all-in-one in the industry but it’s the easiest to use, one of the most affordable, and the most comprehensive,” said Kear. Typically, it’s anywhere between one and ten users in a company who are using the tool daily, managing the details. Planning Pod offers a 30-day free trial. During the trial, or even the first several months with a paid subscription, users can utilize a help center with more than 300 searchable articles, or watch more than 70 how-to videos on YouTube. There is seven days of email support for those who can’t get their questions answered through either of those routes, with a typical turnaround time of three or four hours. Live chats on both the marketing website and inside the application are available from 9:00 a.m. until 5:00 p.m., mountain time. Lastly, users can call a toll-free number to speak with a live person. Subscription charges are based on the number of events customers can work with in the account at any one given time – ranging from one event at a time up to 2000 (though no one has yet signed on for that many). One event at a time runs $19 a month. The website offers up to 50 events simultaneously for $99 per month. When the event is over, customers simply archive the event and it goes off the account, making room for another event. “I would say that the largest package we sell right now is 500 at $249 a month, with the most popular package 25 events at a time,” said Kear. Companies around the world use Planning Pod, with 90 percent of them based in North America and the remainder spread among English-speaking countries including Great Britain, Australia, New Zealand and South Africa. A new dashboard has been fully built out to provide an at-a-glance look at past, present and future events. It’s simple to gage account activity, and who is responsible for it, whereas most event planners have information stored in a variety of places – spreadsheets, emails, binders, post-its and aps. “Even though those planners may be organized and everything is somewhere, they still miss things because it’s impossible to look at everything at once and get a real sense of what is happening and what needs to be done,” said Kear. The company conducted an extensive customer feedback survey in July, 2017, and is using the data and feedback from it to update all of their tools and applications over the next six months, as well as adding some new ones. It’s a constant process of upgrading tools to meet the ever-changing needs of not only customers but the events environment. Expect to see updates to some degree with all of the event tools and potentially additional tools for venues, such as a banquet events order and menu order tools. They are also aiming to integrate more with other platforms so that customers can share data back and forth between them.